Ulster will have to do without influential back row forward Marcell Coetzee for this weekend’s return to Guinness PRO14 action. The Irish Province will travel to Bridgend to face Ospreys as the domestic league returns after a short break. Ulster have three matches in the latest block of games, with a home game against Zebre and a trip back to Wales to face Dragons after they meet Ospreys. Coetzee is likely to feature at some stage during this mini series of fixtures. And assistant coach, Dan Soper, was fairly confident he would be recovered from injury in time for the European Champions Cup quarter-final against Leinster last month. Coetzee delighted Ulster fans last night when the News Letter revealed he had agreed a new three-year extension to his existing contract. 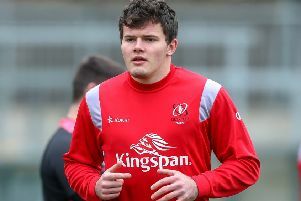 He has been a key member of the Ulster pack this year and has made significant contribution in helping them get to the last eight in Europe for the first time in five seasons. Soper added: “Marcell will not be available this weekend, he is pretty close and doing a lot. In respect of Craig Gilroy’s long term back problem, Soper said the international winger was continuing his rehab. At last week’s open training session at Bangor RFC, Iain Henderson was spotted taking part. However, in spite of being a quick healer previously to a hand injury, Soper said while the British Lion lock was coming along well it would be a while yet. “Until the medics give him the all clear he will keep progressing towards getting fully stuck in,” said Soper.